2017 Poetry Out Loud: Listen to the Words . . .
On Saturday, February 25, 2017, the Ohio Center for the Book at Cleveland Public Library, in partnership with the Ohio Arts Council, will host the Poetry Out Loud NE Ohio Regional Semifinals at 2:00 p.m. in the Louis Stokes Auditorium at Cleveland Public Library, 325 Superior Avenue. This event is free and open to the public. Poetry Out Loud is a national recitation contest created by the National Endowment for the Arts and the Poetry Foundation. The contest is administered in partnership with the State Arts Agencies of all 50 states, the District of Columbia, the U.S. Virgin Islands, and Puerto Rico. 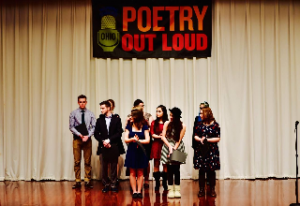 For Poetry Out Loud: Ohio, librarians, teachers or administrators register their high schools each year with the Ohio Arts Council and organize contests with one class, several classes, or a whole school. Contests, workshops, and multi-media program materials, including curricula, are free. Poetry Out Loud is aligned with Common Core and NCTE standards. Learn More. Poetry Out Loud uses a pyramid structure that starts at the classroom level. Winners from each participating school are invited to compete in a regional semi-final contest. In preparation for the Poetry Out Loud (POL) contest, the Ohio Center for the Book (OCFB) has sponsored poetry recitation workshops (open to all participants from Northeast Ohio), facilitated by poet Kisha Nicole Foster, OCFB Fellow who serves as the Northeast Regional Coordinator for Ohio Poetry Out Loud. Similar events have been held throughout the state in preparation for the state finals. The top scoring students from each semi-final will advance to the state finals, which will be held on Saturday, March 4, 2017, at 2:00 p.m. at the Peggy R. McConnell Arts Center Bronwynn Theatre, 777 Evening Street, Worthington, OH. For more information about and to see the calendar of events, visit Poetry Out Loud at the Ohio Arts Council website.